Does Homeowner’s Insurance Cover Hail Damage? Even if you’ve never experienced a bad hail storm, you probably know the damage it can do. Hail storms can end up causing millions of dollars of damage to a community. The largest hailstone on records fell in July of 2010 in South Dakota. The stone weighed almost 2 pounds and was 8 inches in diameter. Sure, not every hailstorm is going to have stones this big, but just imagine one of those hitting your house or your car. It would cause some serious damage. When we talk to clients about homeowner’s insurance, we want them to have all the information they need to make good decisions about their insurance plans. One part of the decision is deciding if additional homeowner’s insurance coverage is worth it. You have to weigh the risk versus the investment. How common are hailstorms in Colorado? Based on numbers from the National Insurance Crime Bureau Report in 2016, Colorado has the second highest amount of hail claims from 2013 – 2015 (first place belongs to Texas). In 2016, there were over 5,500 hailstorms recorded in the United States. More than 50% of the claims during this time were on homeowner’s insurance plan. The hailstorms rack up around $15 billion in damage claims every year. 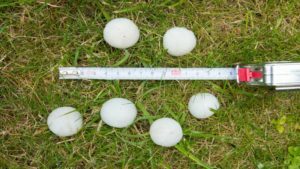 If you live in the Denver, Colorado area, hailstorms are a common problem, and you should consider how they can impact your home and your car. Because hailstorms are a common (and costly) occurrence, you need to know if your insurance policy is going to be there to protect you. The worst thing which could happen would be for you to have to pay for all of the repairs yourself. Every homeowner’s insurance policy is going to cover “acts of God” like wind, rain, and tornado damage. In most cases, the plan will also pay for hail damage, but there are a couple of factors the insurance carrier may look at if you make a claim on hail damage. Before we start outlining homeowner’s insurance and hail damage claims, you need to understand one thing: every insurance carrier is different. All of them have different guidelines and coverage limits. We can give you a basic idea of homeowner’s insurance, but the best way to know, is to call your agent or give us a call and we can walk you through your plan. There are some companies out there who are going to look at the age of your roof. If it’s younger than 10 years old, there is a good chance you’ll have full coverage. If it’s older than 10 years, you may not get the full value of the repairs. For some carriers, older roofs only get reimbursed the depreciated value of the roof. The older the roof is, the more wear it has, which means the less money you’re going to get. Additionally, most insurance carriers are going to send out a roof inspector when you file a claim. Why do they do this? The insurance company is going to protect themselves against scams and false claims. The inspector is going to determine if the damage is from old age or from the hail. You can’t control the weather. There is nothing you can do about Mother Nature, but there are a few ways you can prevent any unnecessary damage and costs. One of those is to have a roof expert come to your home. They can tell you if you have any damage already and show you some areas you can improve. If you have any loose shingles which need replacing, you should do this before the hailstorm hits. You can also invest in different shingles. If you’re willing to put in the money, you can have impact-resistant shingles put on your roof. They are more expensive than the traditional option, but they are built to withstand hail damage. An additional tip for dealing with hail damage is to take a picture of your roof before (you can do this at any time), and then you can take a picture if there is a hailstorm. This will help the inspector and the insurance carrier see the difference in the roof before and after the storm. This could be the difference in you getting reimbursed or having to pay out-of-pocket. Dealing with insurance policies and carriers isn’t easy. There are so many restrictions, clauses, and loopholes, it can be crazy trying to decipher policy. Most policyholders just want to know they will have protection in case of a disaster. You don’t have to be an expert on everything insurance related. All you have to do is be able to make one call. We will handle the rest. At one goal at Longevity Brokers is to protect the Denver, Colorado area with every kind of insurance plan out there. Questions? Comments? Use our contact page or call us (720) 209-4598. ← Does Car Insurance Cover Break-Ins?